GY Mono Block Style Holders. Solid one piece design for your grooving applications. Offered in 1.00 inch shank, right and left hand holder. Seat sizes from D through J in metric and inch sizes. .079 inch / 2.0 mm through .250 inch / 6.0 mm. Short and long groove depths to maximize productivity. All Mono block grooving applications. Two depth of cut offerings to maximize productivity. Shorter depth of cut to maximize rigidity. 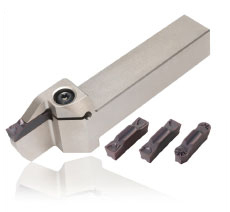 Utilizing current GY inserts ensures quality precision grooves. Current GY insert offerings provide efficiency, quality, and surface finish. Various insert widths, designs and grades for all your grooving applications.